Comfort food recipe that has quickly become one of the favorites in my house. 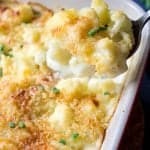 Cauliflower Au Gratin with the addition of potatoes is so creamy, cheesy and such a delicious side dish for holidays as well as for Sunday night dinner. As you have probably noticed I’m obsessed with Gratins. Recently I’ve been making them non-stop. My Eggplant Gratin, Potato Zucchini Gratin or Chicken, Potato and Bacon Gratin are among my most popular recipes at home for a reason. Whenever I have some kind of celebration at my house, I make sure to prepare one of those Gratins and they always disappear quickly. Baked to their bubbly and crispy perfection, gratins are so satisfying and make a perfect side dish for any occasion. 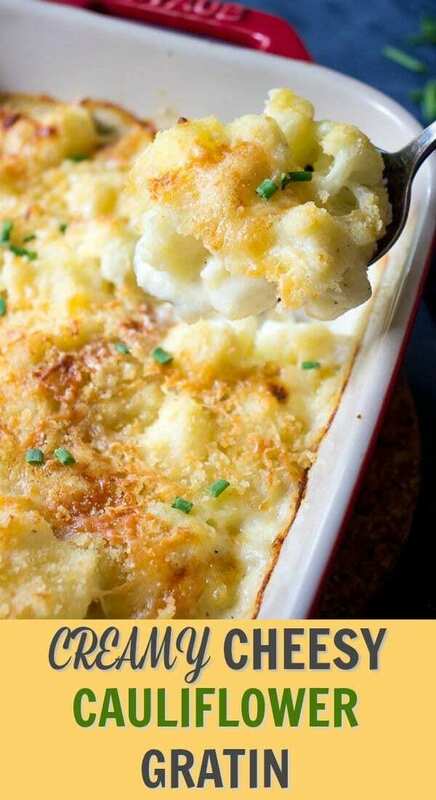 My today’s recipe is inspired by Ina Garten Cauliflower Gratin. I first made it a few years ago and immediately fell in love with the simplicity of preparation process and the excellent taste of the dish. I love Ina’s original version of the recipe but I decided to add potatoes for more volume and nutrition. 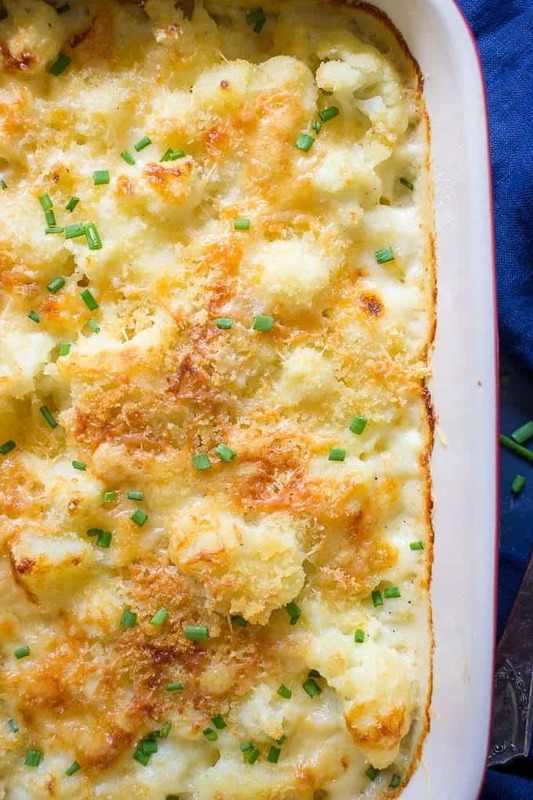 What I really like about this Cauliflower Au Gratin or any other gratins is that you can make them ahead of time, which is very convenient for Thanksgiving or Christmas. Just assemble everything in a baking dish, cover with a foil and store in a fridge for a few hours or even overnight until you’re ready to bake it. In this recipe I used Gruyere Cheese. I absolutely love it. It has a nice flavor, a little crispy bite and works amazing in so many recipes. If you don’t have Gruyere, use my suggestions below. Steak Chateaubriand – French classic ready in under 30 minutes. Preheat the oven to 350F. 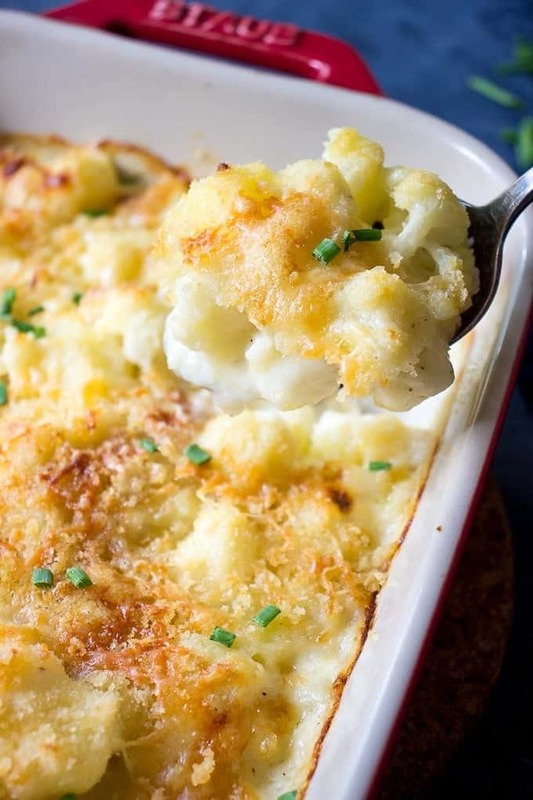 Pop Cauliflower Au Gratin in the oven and bake uncovered for 20-30 minutes until it’s hot throughout. Bring a large pot of water to a boil. 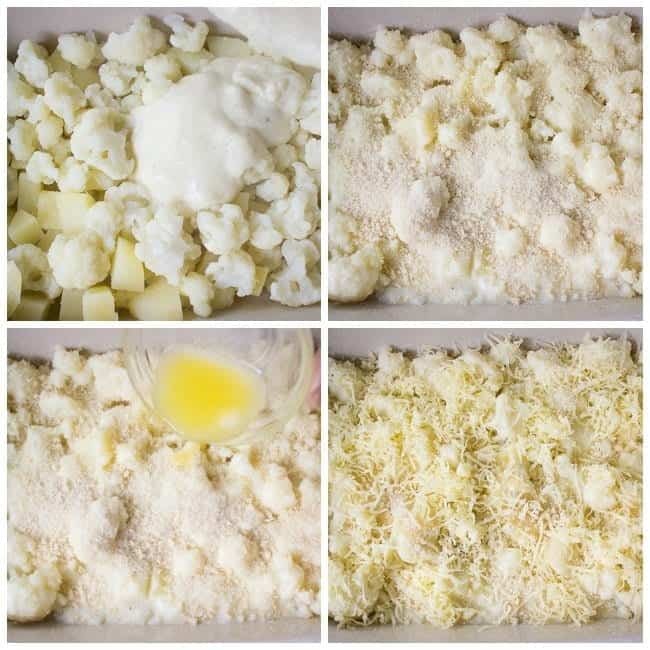 Add 1 teaspoon of salt, cauliflower florets and potatoes and cook on a medium heat for 7 minutes. Drain. 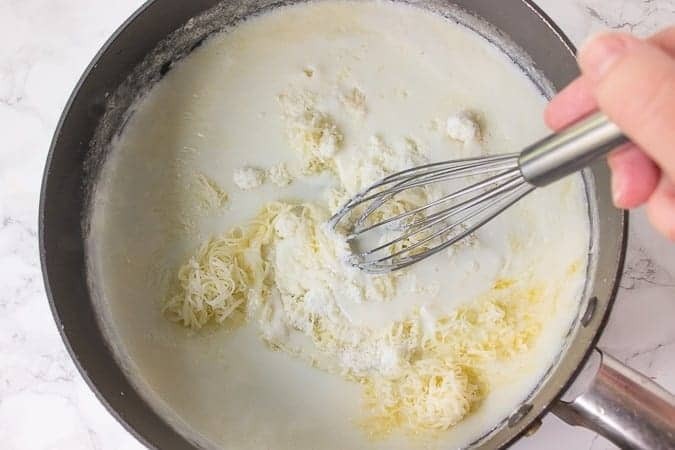 In a medium saucepan and over medium heat, melt 2 tablespoons of butter, add flour and whisk to combine until no lumps remain. Add warm milk, stirring constantly until the sauce thickens. Remove pan from the heat. Add the remaining 1/4 teaspoon of salt, pepper, 1/4 cup of Gruyere cheese, Parmesan and nutmeg. Give it a whisk. Give sauce a taste and add more salt if needed. 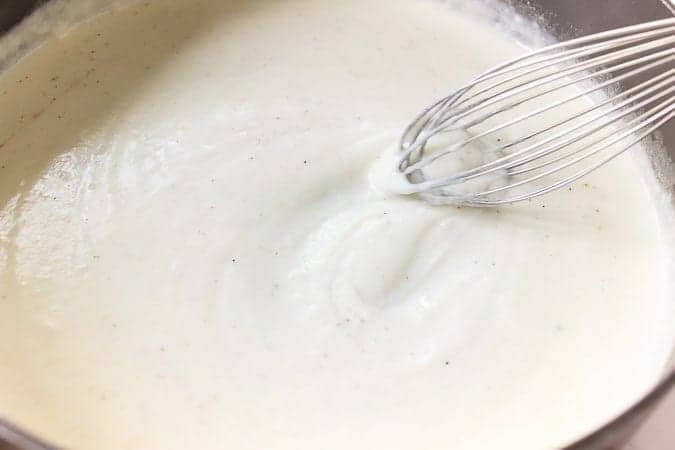 At this point you should have a silky smooth white sauce that works great in so many recipes. 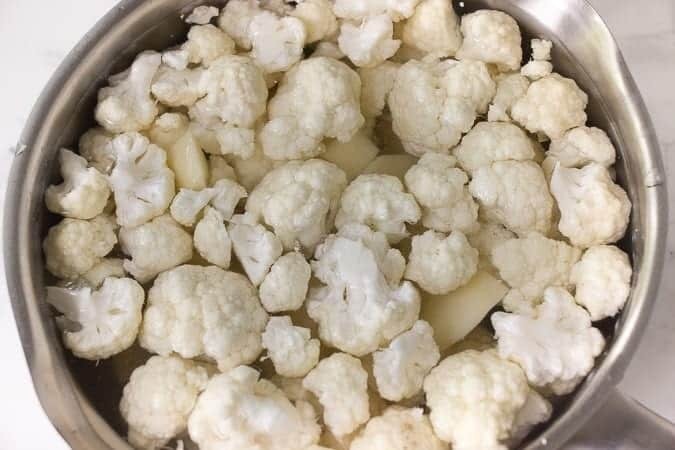 Transfer cooked cauliflower and potatoes into the 8 by 11 inches baking dish. Cover with a white sauce and carefully mix to combine the ingredients. Sprinkle Panko breadcrumbs, drizzle with the remaining 2 tablespoon of melted butter and sprinkle 1/4 cup of Gruyere on top of the gratin. Bake for 25 to 30 minutes until vegetables are tender. Turn on the broiler and bake for 2-3 minutes until top of the gratin is golden brown. Yum! If you make my Easy Cauliflower Au Gratin, snap a photo and post it on Instagram with a hashtag #lavenderandmacarons. I’d love to see your creations. 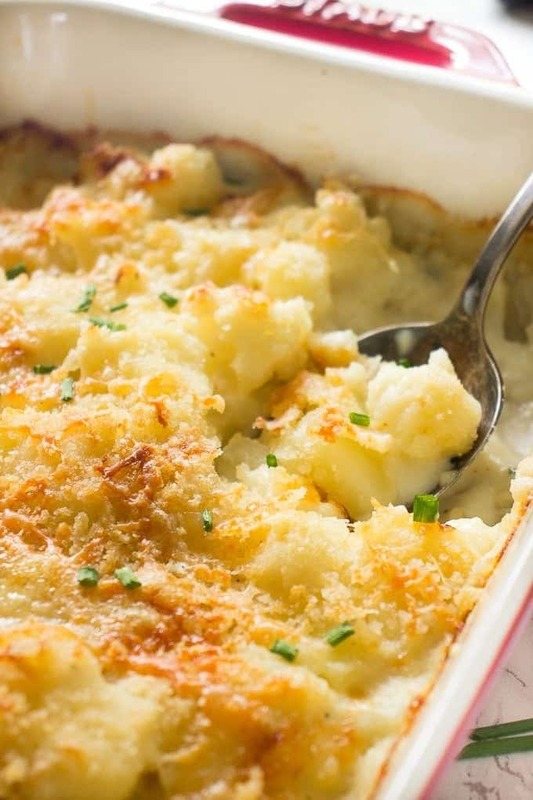 This Creamy Cauliflower Gratin with Potatoes are one of those side dishes that you'll wan to make over and over again. Easy to put together and so good! 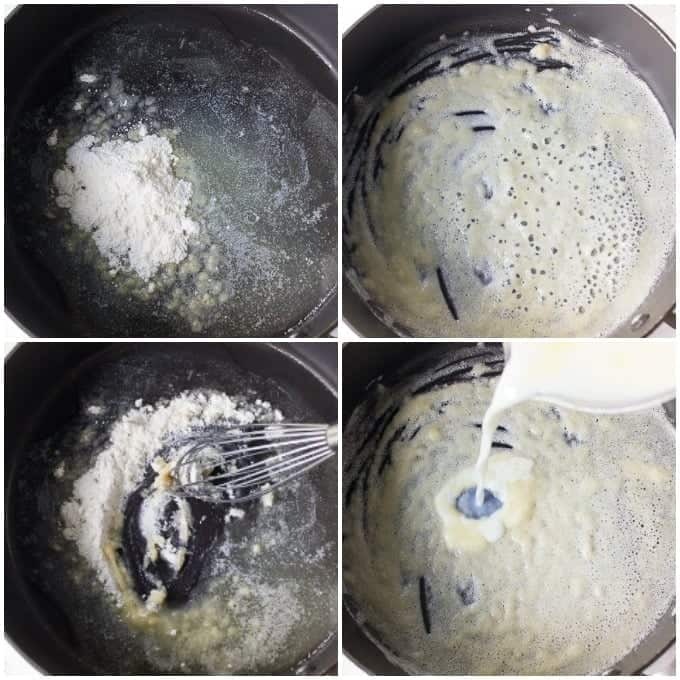 In a medium saucepan over medium heat, melt 2 tablespoons of butter, add flour and whisk to combine. Add warm milk, stirring constantly until the sauce thickens. Remove pan from the heat. Add the remaining 1/4 teaspoon of salt, pepper, 1/4 cup of Gruyere cheese, Parmesan and nutmeg. Give it a taste and add more salt if needed. Transfer cauliflower and potatoes into the 8 by 11 inches baking dish. Cover with a sauce and carefully mix to combine the ingredients. Sprinkle Panko and the remaining 1/4 cup of Gruyere on top of the gratin and drizzle with 2 tablespoon of melted butter. Turn on the broiler and bake for 2-3 minutes until top of the gratin is golden brown.